Hello dollsies! 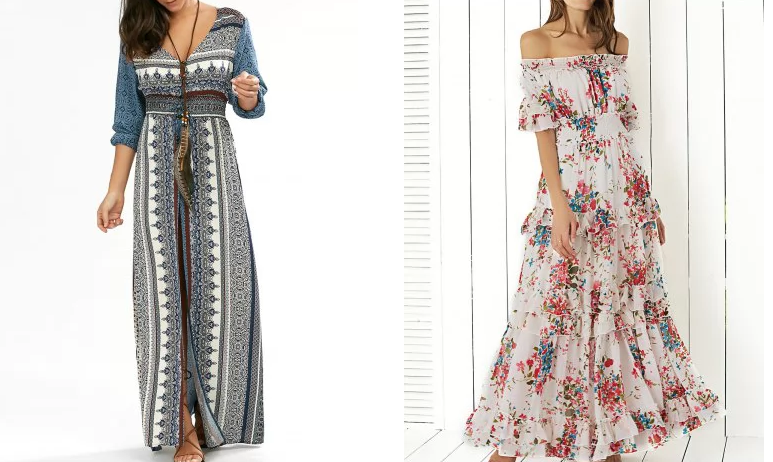 Let's say, that I got a really interesting task, to become a fashion journalist for a day and the first thing that came across my mind were bohemian dresses. I was searching for some inspiration at my beloved webshop - Rosegal. Boho-chic is a style of fashion drawing on various bohemian and hippie influences, which, at its height in late 2005 was associated particularly with actress Sienna Miller and model Kate Moss in England and (as "boho" chic) actress and businesswoman Mary-Kate Olsen in the United States. It has been seen since the early 1990s and, although appearing to wane from time to time, has repeatedly re-surfaced in varying guises. Many elements of boho-chic became popular in the late 1960s and some date back much further, being associated, for example, with pre-Raphaelite women of the mid-to-late 19th century. For me, boho is very pleasant, comfortable style, which screams "Come on girl, have some fun, and don't think about your tight dresses. Let loose!". Maxi printed dresses with geometric, floral, lacy-knit and see through patterns are a pefect match for a relaxed weekend getaway in summer. Get rid of everything that makes you feel uncomfortable - such as high heels. High heels and boho style - that's a big no go. Boho is all about comfort, esepacially regarding shoes. Instead of a too high shiny high heels, choose cute platforms or cute wedges. Or even better - just stroll around barefoot and buy yourself some knitted sandals. Do not forget about accesories - lots of them. More bracelets that you wear, more boho you will feel. But hey, DO NOT exaggerate! It's okay to combine a few colors, such as brown, white, blue or yellow, but don't mix it up too much. Four colours on your bohemian outfit are enough. You really do not want to feel like a clown, do you? I have made a list of 5 most aestheticaly pleasing dresses I found at Rosegal and I want to show them to you. Also, they are cheap, they are fun and beautiful. So, you want some new clothes, why not taking a look over here? Summer sales are ongoing, all from 33% off. Use code RGEN for another 10% off. Time for a new outfit! I would love to see your stylings. Please, send them to blogninnieboo@gmail.com, best ones, I'll post on my Instagram account.